I am very convinced that the big flat screwdriver with cap opener and cable stripper was designed to be a versatile function for more uses than I did mention. 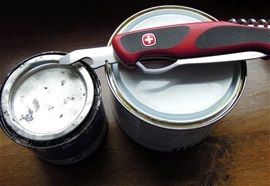 It can be used to open the lid on paint cans and to be a holding device. The awl on the Ranger knives is handy for a starter hole when using the flat screwdriver on wood. The push locking on the screwdriver is very handy because it prevents accidental closing. 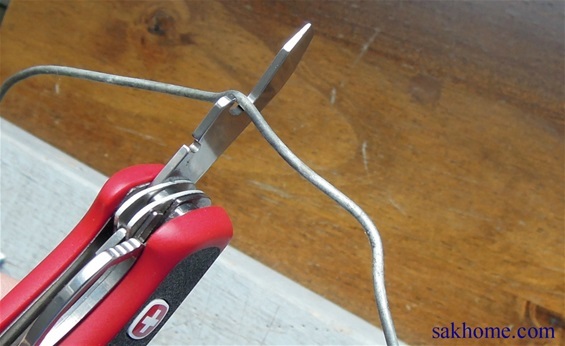 The flat screwdriver on the Rangers can be used as a holding device for a hot wire for example. In the nature when cooking this can be a handy tool. The Ranger knives fit just as well at home too. I have tested the flat screwdriver on many different screws, many more than on the picture. It is solid made and can be used for many tasks. I cannot find any negative things to say about it and I have used more force on this function just to see if it can take the little extra. It can be used on machines and devices with open screws. Because of the shape it cannot be used on hidden screws because this would require a longer and round shape. The Ranger can be used on fishing gear or on an outboard engine gasoline tank. Remember with the flat screwdriver on the New Ranger knives that it is important with a controlled push towards the head so the screwdriver locks into the screw and the spring on the knife. With some experience this is a comfortable screwdriver and it serves a good purpose. This prevents the accidental closing and this is an advantage. Remember that the cut part of a flat head screw is sometimes shallow and these are not comfortable for any flat screwdriver in my opinion. With these it is even more important with a controlled push or press and the firm controlled turning. I have no idea why some got that very shallow track on the flat heads. For sure the Wenger flat screwdriver can be used on them. There is a limit for how large tasks it can do. It is a solid design for sure. The advantages are there with a screwdriver that follows the length of the construction because you can reach. There are more advantages with the Hex opening used on the Wenger knives, or some of them. This you can use adapters and long bits + you get a very good momentum and strength. The best is always the functions that are assembled in the total construction for many. Take a look on the page for Hex opening and combination tools around my page. I have no complaints on the Wenger New Ranger screwdriver! I have touched this before and on the picture you can see a flat screw head. I am not sure what kind of bits are supposed to fit this properly. The track is very shallow and everything is not in proportion. This I have seen on many different applications and forms. It would be better with a different design. I know that this shall be sunk into the material. Maybe it would be better with a different design. They are uncomfortable for any bits and please let me know why it cannot be different made. I have used the Wenger on such a few times and it can be used on these. 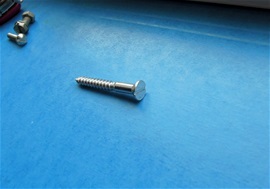 Today it is normal to use different screws for many applications. Some are for softer and harder materials. It would be better to use Philips heads on some rather than the shallow flat head track. The problem today is that I have found the shallow flat head on many different applications. On plastic materials, wood materials and others as well. It can be different metal materials used in the screws with brass included. The problem with the shallow track is the possibility to damage them very easy, a few slips and the track is completely damaged no matter on how precise the screwdriver or bits are. I understand that some are made so because it is for appearance and so on. It is not pretty with the damaged track either in my opinion. Maybe a Philips head would be better? Or make the construction of the flat head deeper and with a different design. The Wenger flat screwdriver is very good and it is a kind of universal design that would fit very many different types. So wenger is correct designed by a professional Company and i like it very well!